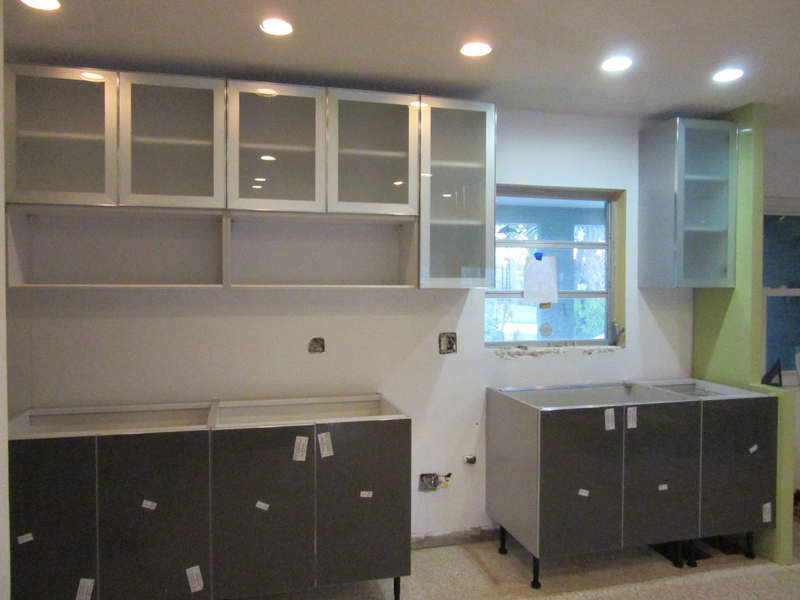 It was a productive day with the install of all the upper cabinets and lower cabinets along the outer wall. 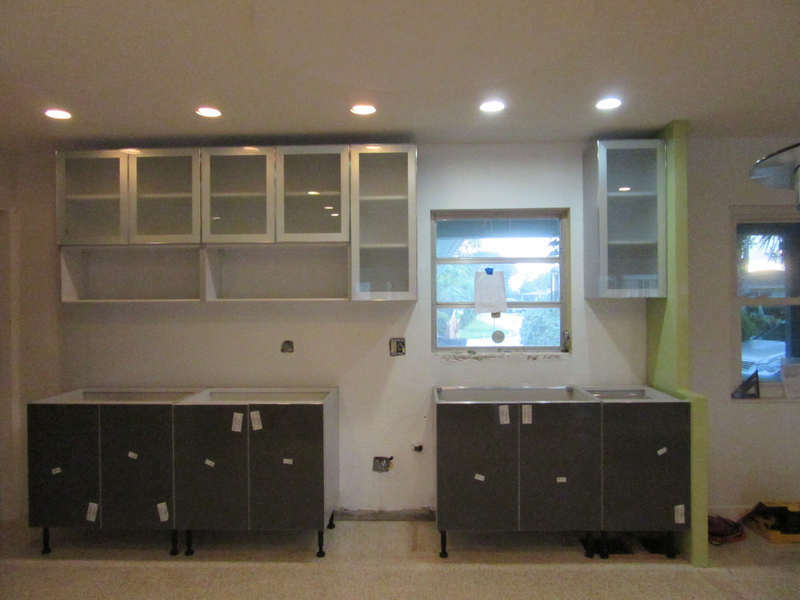 The empty space in the lower cabinets is for the dishwasher. We are missing a couple of green glass pull up doors for the lower cabinets above the counter so they been back ordered on a rush. The lower cabinets are a dark grey but still have the plastic on them so it`s hard to see the real colour in these pictures. 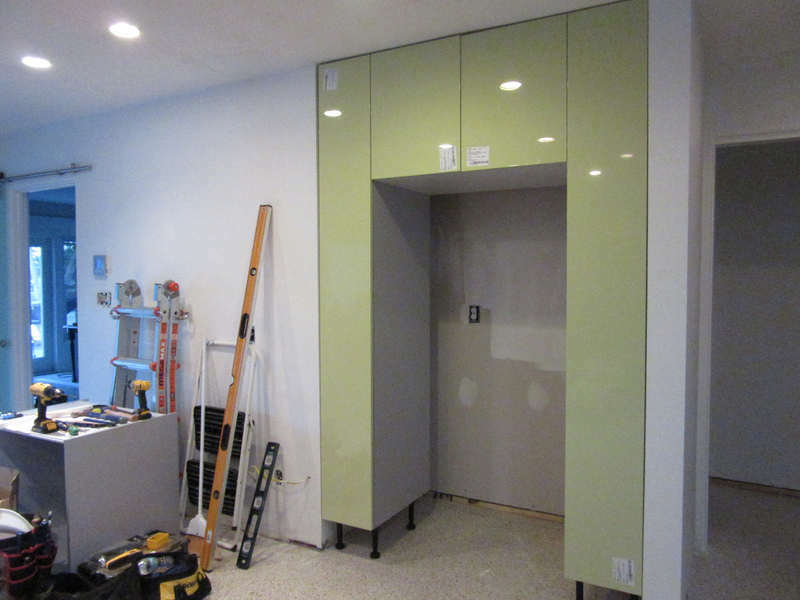 I love the new lime green pantry doors that will surround the refrigerator and tomorrow you will see this frame surround all the cabinets on the outer wall. You can see it part of it on the right side but it will go all along the top and down the left side as well. Tomorrow they will build the cabinets beside the fridge where we will have a wine cooler at the bottom and a roll top cabinet on the top. Maybe they will even start setting up the island so we can stop bumping our heads on the range fan. 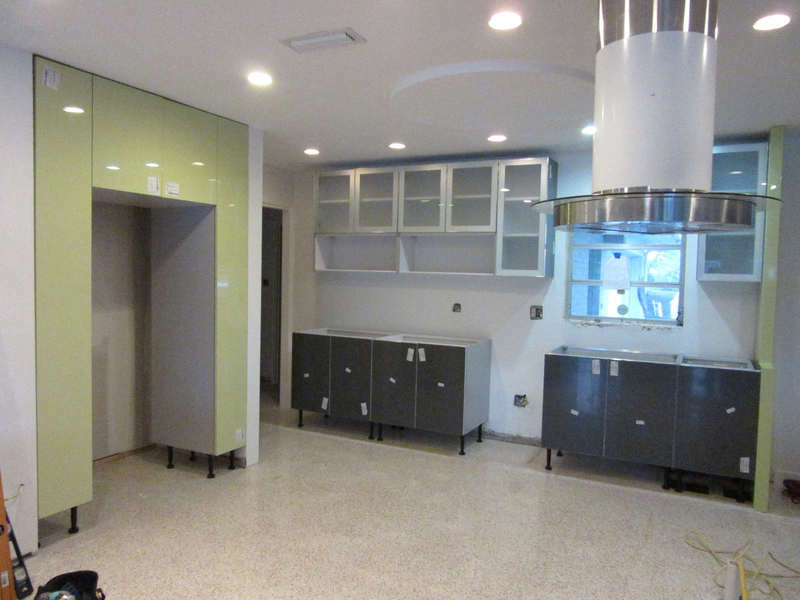 This kitchen is going to be amazing when we are done! But I am getting pretty good a barbequing and my Girl Guide camping training is coming in handy. Do you remember when we would go camping (Alice kayaking ) and everything was made was put in foil packets and then put on the grill or fire. Well I have become an expert at using this method and we have been eating really well. Works great for any type of fish and all our veggies. Who needs a kitchen !! LOL !!! That was a great trip with WildHeart Adventures. Also making the omelets in baggies and cooking them in boiling water. Your kitchen looks quite roomy. I’m sure you’ll have fun filling it up.